Are you in high school? Not sure how to plan for college application? Looking for financial aid options and best-fit colleges? College Prep is for you. COLLEGE APPLICATION GUIDE - Explore our guide to understand the application process and financial aid options. 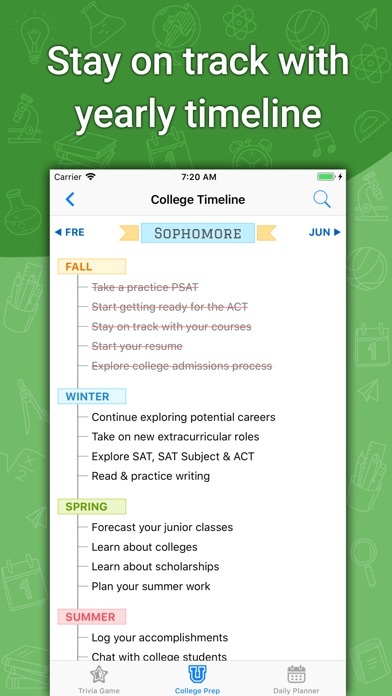 Follow the timeline to know what you should be doing in each high school year. Find out the estimated net price for a college degree based on your situation and preferences. Watch advice videos from counselors and college freshmen. Use our to-do lists, and receive notifications for college application and financial aid events. 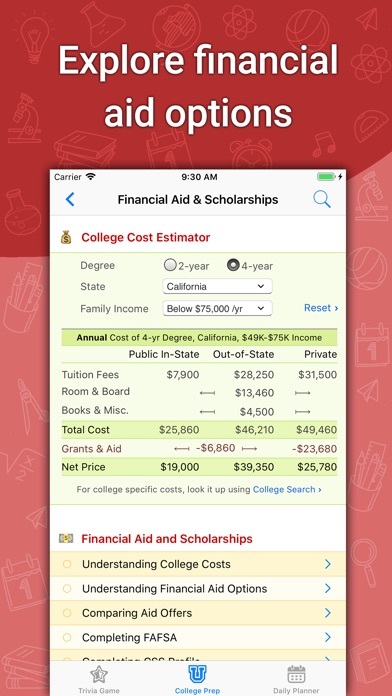 COLLEGE SEARCH - Filter and compare schools by programs offered, location, size, annual costs, financial aid, test scores required, student life and potential earnings. 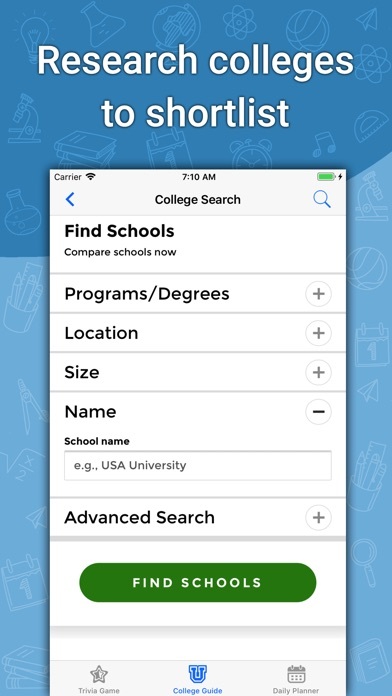 Shortlist your favorite colleges in the app while assessing schools that meet your needs. 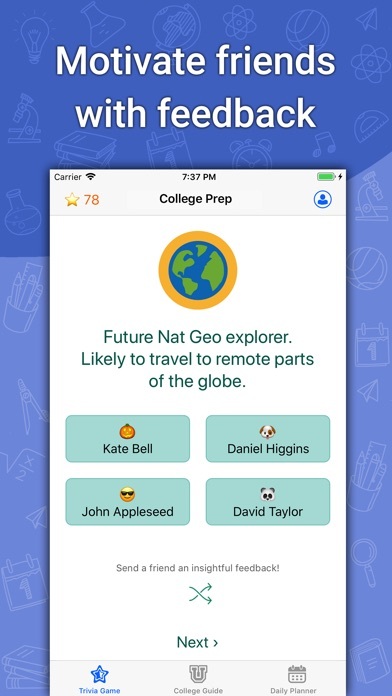 COLLEGE TRIVIA - Play the college trivia game to find out how much you know about college. Share interesting facts and college advice with your friends too. 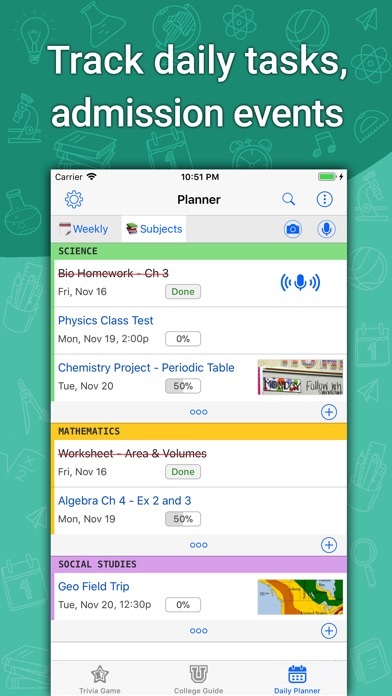 DAILY PLANNER - College Prep includes a high school planner to help you track homework, admission tasks and deadlines. Take photos or use your voice to create tasks quickly and stay on top of your busy schedule. Learn about finer details of scoring well on PSAT, SAT, ACT, and AP tests from College Board. Research different volunteering options, and master the art of writing a college essay. Explore and compare various financial aid options such as FAFSA, college scholarships, and grants to make college affordable. 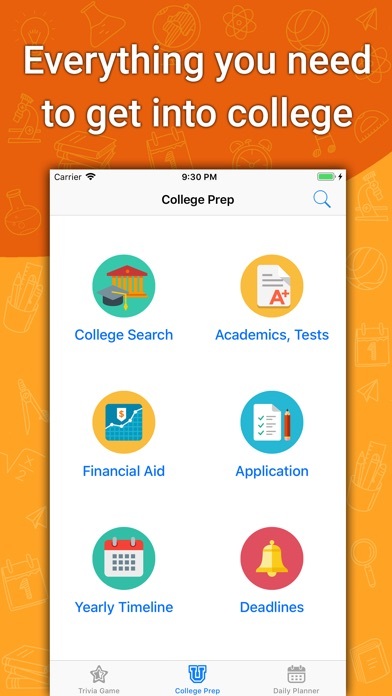 College Prep is a free college app without any ads. Start your college application process early and give it your best shot with minimal stress and anxiety! This app is very helpful! It’s fun and interactive and helps me keep everything organized. I’m notified of things when I need it and I am able to keep track of things. Finally found the app that I had been looking for! We high schoolers are quite busy. It is easy to miss an important task or a college application deadline. 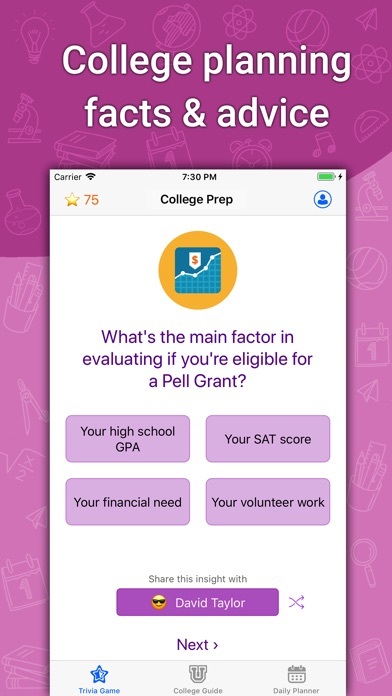 Quarterly college planning guide with short videos, planner with photo and speech, and interesting college game make it a unique, must have app for any college bound overworked high schooler.